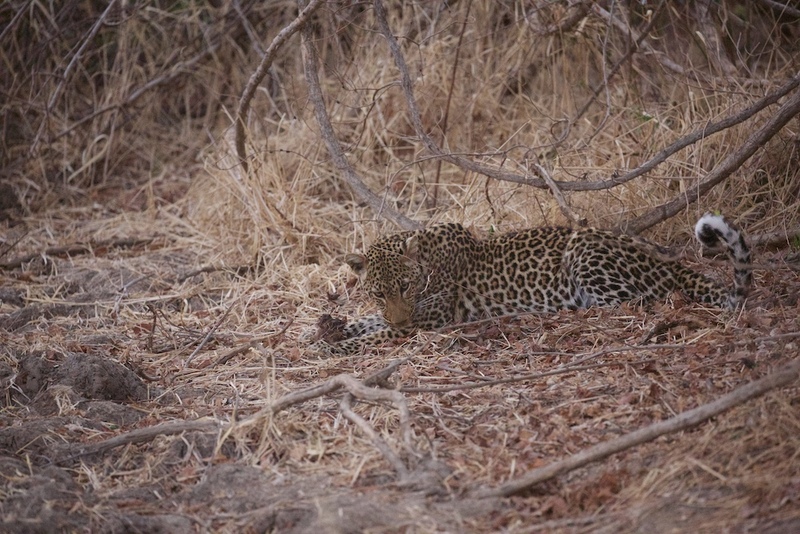 With our ever-expanding business in Zambia, we decided to head to South Luangwa in high season to check out some of the more remote bush camps, as well as some of the surrounding parks you may not be so familiar with! I flew to South Luangwa and landed in Mfuwe. I was met by Jens who owns the newly opened Chikunto Camp. Some members of the team had already visited Chikunto, so, I was eager to see how Jens had made his stamp in South Luangwa. With 4 beautiful tents based on the river, Chikunto is excellently placed away from the busy Mfuwe area near the Nsefu sector so you can take drives in either the quieter areas or if you are missing something from your list you can head south where there are more cars and prolific wildlife to try your luck there. Chikunto has some of the best food I have ever had on safari, not just in the valley but full stop! They have created a really nice ambience at the lodge with a modern yet comfortable feel. With the addition of boating safaris in the green season, the lodge offers some unique and exciting experiences. 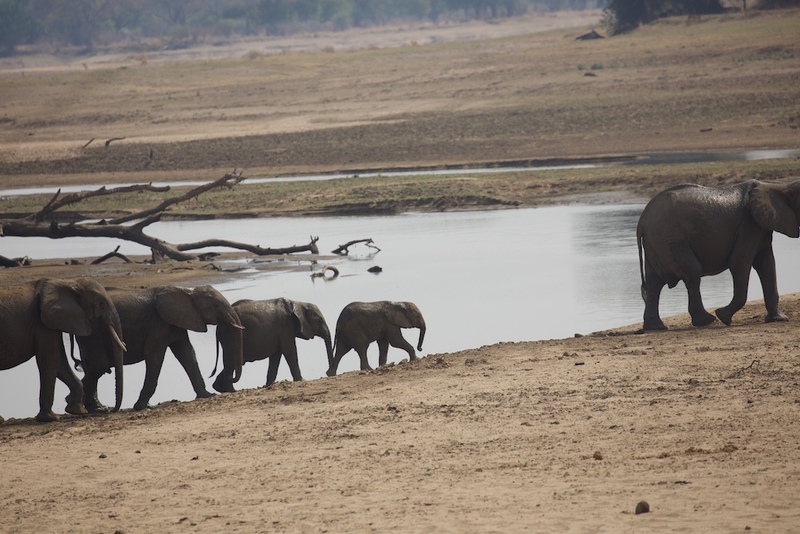 Next, I visited the Remote Africa camps in the very North of South Luangwa. I started off by crossing the river (and park boundary) by canoe to the GMA, we took a very short drive to another river before taking our second canoe across the river and a short drive to Crocodile camp. The only road here is the one into camp. The name of the company perfectly describes the camps, you will not see another person, no roads, no cars, no people, however, there are a ton of animals. The focus here is walking safaris, which are really excellent, the guides are amazing and really know their stuff from tracking to ID’ying. As a former guide, I really give any guide a run for their money but I have not walked in a while and as a keen photographer I was excited to see how much I enjoyed walking again. Somewhat an oddball, I love insects with the humble dung beetle being my favourite animal, on my walk we got to see ants eating a scorpion which for me was very cool. 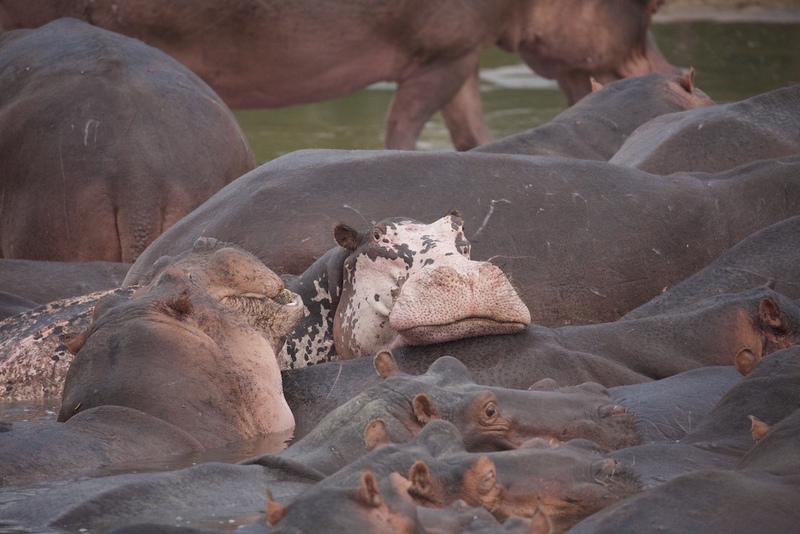 However, we also saw lions on a wildebeest kill, hippos up close, vultures, hippo out the water during the day as it was raining and a variety of Kudu, antelope and Warthog! 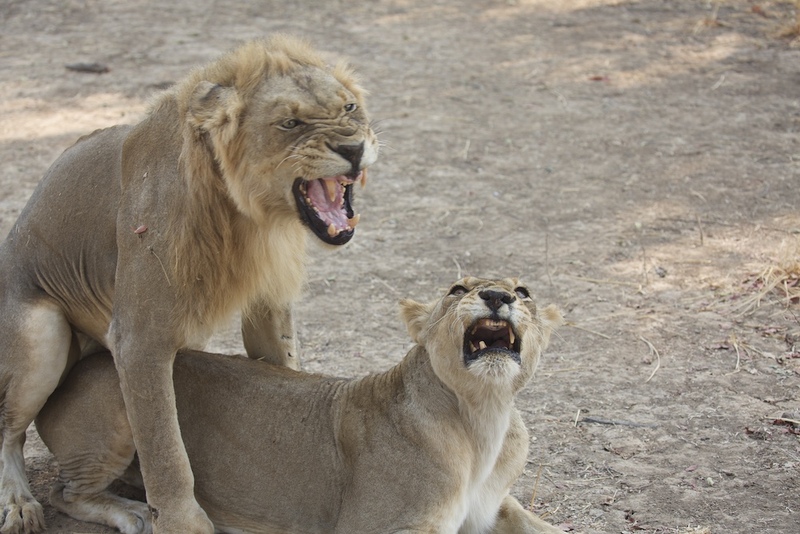 We even had a little mock charge from a lioness, which was amazing (the guide and scout barely flinched!). What also surprised me was the comfort level and good food, from fresh salads to local African cuisine I wasn’t at any stage feeling like I missed something from the big city! Most excitingly at night, a young bull elephant decided my chalet would make a great scratching post then started to eat from my roof. Peering out where I could, I watched this gentle giant as he made his way from one chalet to the other! Magical! The next day we headed to Tafika, so back across the river to the main camp where you can do a mix of game drives and walks in the very North of the park. With huge salt pans and a good mix of vegetation sightings are excellent and I’m pleased to say we saw large flocks of crowned cranes, leopards, lions and I heard about the wild dogs spotted in the morning (damn!). Again the food here was excellent but what I really loved was the family environment. From Carol and John who own RAS who sat and had meals with us telling us tales of the bush to Bryan, their photographic guide who has been there for years to Isaac, who was the first black guide in the valley and at 72 his eyesight only seems to get better! Each meal was taken communally with whoever was in camp from Tom the pilot, the Coppinger family, to the guides, this was a nice touch. From here I flew to North Luangwa with their resident pilot Tom, an incredibly scenic flights along the river where we were able to spot hippos, elephants, puku, zebra and waterbuck! It took just under 30 mins then we landed just a short drive away from camp. To get into camp we had a shallow river crossing but I’m told in less dry moths you wade across the river to enter the camp, a unique way to enter this remote piece of paradise. One of only two lodges in the park (although RAS are opening a second lodge here next year) it is ideal for those looking for a real walking safari or looking to see rhinos. A sensitive topic, there are heavily guarded rhinos in NL, which are being monitored around the clock by the anti-poaching team and the Frankfurt Zoological Society. Here there are just 4 rustic thatched chalets, which overlook the river. The rooms are very basic yet very comfortable. It is a real get back to nature feel with great food and guides, who are the stars of the show. For those who are worried about walking don’t be it doesn’t have to be strenuous for one of our walks we stopped at a hippo pod for around 2 hours watching them fighting and interacting which was great-our sundowners turned up and then we took the car home so it doesn’t have to be anything more than you can handle! I then flew from North Luangwa to Luambe National Park, another camp off the beaten track, there is only one bushcamp here (although they are expanding to create two). Here I bumped into some of the brilliant guides from the Sanctuary camps. So we knew straight away the guiding would be superb. Luambe was great! The tents are huge and well thought out, guiding is great and although the animals are a little skittish this makes for great photography and sightings! There is nothing worse than a sleeping lion doing nothing, a mock charge from a juvenile elephant is a much more exciting sighting! Although I didn’t see one apparently serval sightings are very common! I really enjoyed it here and loved the isolation from other camps and vehicles. I think this is a great place for those who have been on safari before and looking for something new and different! I flew back to South Luangwa and went to the newly refurbished Lion Camp; modern and sophisticated it is the perfect place for those that want a mimosa after their morning game drive. With modern furnishing in the room including a bed cooling system, a huge walk-in shower that is open to the main room and a sweeping balcony it is a very sophisticated bush luxury. The food was incredible with private dining and a more ‘South African’ timetable for eating. The animals in this area are prolific, particularly just in front of the lodge where a waterhole runs alongside before a large open plain which regularly attracts plains game, as well as a herd of elephants and of course lions, from which the lodge get its name! Our only criticism is the rooms are close together so you can often see your neighbours! From here I went very south to Kafunta’s bush camps. Unfortunately for me, the Island Bush Camp had had a torrential downpour so luckily for me I got to spend 2 nights in the new 3 Rivers Camp which I loved. The camp is set on the afflux of 3 of the Valleys Rivers so there are lots of wildlife around the camp. Each chalet either overlooks the river or waterhole at the back and I think the rooms are incredible! Each has a huge living area and huge bed, overlooking your own private decking, then a separate en-suite bathroom with inside and outside shower. And the icing on the cake is your own sleep-out deck. At no extra cost, you can choose to sleep up on the deck which you access by the side of your room and the bed can be set up as inside with a large mosquito net over it. It was such a magical treat to spend time up here either during the heat of the day or by the moonlight (go in a full moon for some incredible views of the visiting animals). Truly magical and if you do decide you don’t like it you simply move back down to your bed! The wildlife here was also great, although a little more skittish than in the rest of the park we had some really unusual sightings here like mongoose fighting almost to the death, a large spitting cobra and a Gemsbok! Here you have the chance to do some great walking in a very quiet southern part of the park as well as drives night and day. A really nice combination with the main lodge at the park entrance where the focus is more on drives and is busier. The main lodge is about to go under a big refurbishment so we are looking forward to seeing what is in store and seeing the Island Bush Camp next year! If you would like to know more about these camps and destinations email me at Chloe@malawianstyle.com.